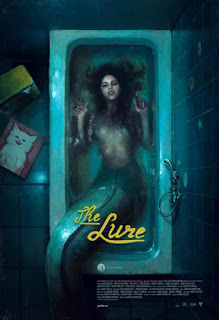 This past week I was reeled into my favorite movie haunt The Screening Room to see the first run premier of 2015 Polish horror movie The Lure. The movie is touted as a"bold genre-defying horror-musical mashup" about Polish mermaids. How could I NOT want to see it?! I prepared myself by NOT watching any trailers, I wanted to be surprised and I was. Before the movie, at the concession stand, the little woman working there said, "Are you ready to watch a comedy? Just kidding. This is a really weird film." I laughed and thought, the weirder the better! Andrew, my husband, and I got there early and had our pick of the chairs. I love that The Screening Room has a variety of seating depending on how you enjoy watching movies. There's cushy movie chairs, dining room chairs, high backed bar stools, a couch, high backed living room chairs, even a cushioned booth. We picked the high back living room chairs this time. The Lure began with beautiful animation. Andrew was excited it was subtitled because he doesn't hear very well. It's in Polish - duh. The guy that runs the club sees the two mermaid sisters, aptly named Silver and Gold and is hooked. At this point the girls have legs, and can change into mermaids when they pour water on their bottom half. (I was wondering how the mermaids would be getting around on land.) They become the new stars of the club. Not only do they have beautiful voices, they can jump in a giant champagne glass of water and turn into mermaids! 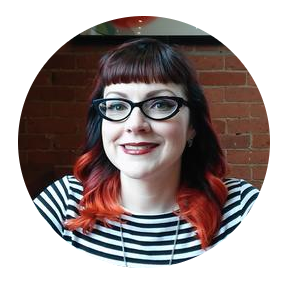 Here's where mermaid lore comes into play. If a mermaid falls in love with a human and he marries someone else, she'll turn into sea foam. Also if a mermaid cuts off her fin, she can no longer sing. I won't give away all the details of the film, but it's not a fairy tale ending. Keep these tidbits in mind if you go to see The Lure. It starts off as a strong unique film, then by the end diverges into a ho-hum drama. Now was this movie a horror movie? I'd say NOT so much. There's small hints of horror. There's a surgery scene, with close-ups of the cutting and stitching, but it's more horrific to understand why it's happening. So this movie doesn't really have gore for gore's sake, it's bloody for a reason. The mermaids seem to have a lust for eating human hearts too, ok that falls under "horror", but there's only four killings throughout the story, three done by the same mermaid. All seem to avoid showing too much detail. It sounds strange, but there's plenty of blood, without it being graphic. The scenes are in a small confined space of a car, or at night. The last scene is probably the most graphic with a close up, but even then it's still lacking in to horror department. Was it a musical? Yes. There's music almost constantly throughout the whole thing. It's nice that they tried to feature all genres of music including punk, disco, pop, autotune, and even a Lady GaGa-esque song. I felt that some of the song lyrics didn't really relate to the storyline and the few songs they added choreography to seemed forced. All in all, the acting was good, the mermaid fin tails looked very real, and the fact that the mermaid sisters could communicate with fish sounds ~ like telepathy ~ was a unique feature to the story. What a weird and interesting sounding movie. The theater sounds really fun too! It was an odd one.